Coordinating events has come naturally to me since I've been in the industry - on all sides - for over 13 years. I only work with vendors I trust and who offer a great product or service. My goal is to make sure your wedding is the party to talk about and the one to put all over Pinterest! Even if you're not sure what your dream wedding looks like, I will help you come up with creative concepts you may not have even thought of! My main goal is to make sure clients (YOU!) are happy working with me AND vendors (the people who make all dreams become reality) are happy to work with me as well! This isn't something you'll see all coordinators saying. I've learned this through working as both a vendor and a coordinator that it's important to keep respect on both sides of the process. Check out one of my favorite weddings that was featured on Style Me Pretty: Steve and Brooke went through a variety of different color schemes and theme ideas. We finally decided on a Vintage Hawaiian theme to go with the couples colorful personalities and to embrace their new island home. 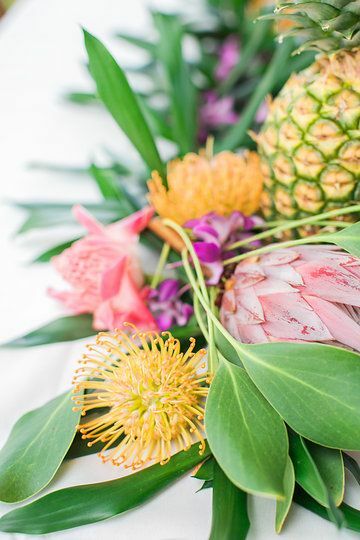 From temporary tattoos featuring the couples' faces to custom Hawaiian shave ice spiked with vodka to the 5 different catering companies and 3 different florists there were creative touches all around the oldest church on Kauai and a tropical botanical gardens in sunny Poipu. Contact Kristine for a custom quote to coordinate your event! In order to make your visions work proportionately within your budget, we have found that most of our clients tend to have a budget of $600 per guest and up. This budget allows for the sense of creative quality & overall design we want to achieve. Do you have a location in mind? Have you booked any vendors yet? What are your ideas?